Groundbreaking is Saturday for Martha's Vineyard Museum at former marine hospital in Vineyard Haven. Two Vineyard nonprofits have been awarded large state grants to help complete major capital projects. The Martha’s Vineyard Museum and Featherstone Center for the Arts both announced this week that they had received capital grants from the Massachusetts Cultural Council’s cultural facilities fund. The museum received $225,000 and Featherstone received $125,000. The grants will go toward renovation and expansions under way at both institutions. The museum breaks ground this weekend on a multimillion project to relocate its main campus from Edgartown to the former marine hospital overlooking Lagoon Pond in Vineyard Haven. 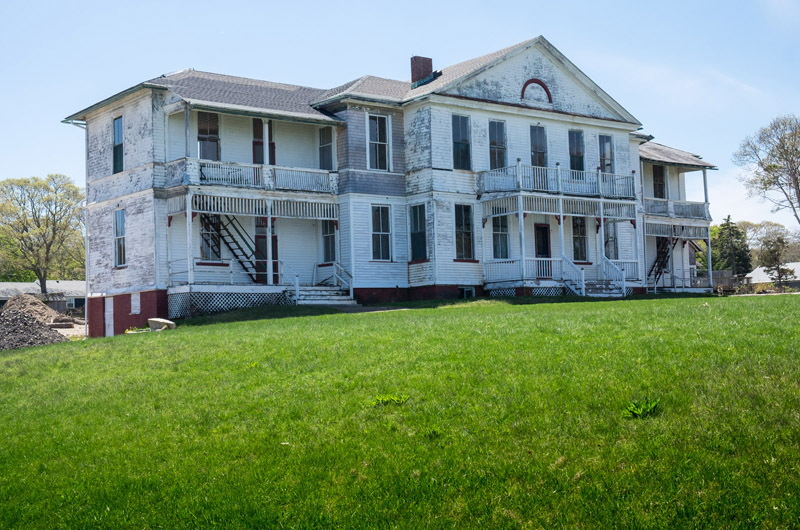 Phase one of the project is estimated to cost $24 million, and will include a complete renovation of the 1895 hospital and construction of a pavilion to house the historic first order Fresnel lens formerly used at the Gay Head Light. The groundbreaking ceremony is planned for Saturday at noon at the marine hospital, rain or shine. “This grant is a wonderful endorsement at the perfect time as we move ahead with the next stage of the project, and put a shovel in the ground,” museum executive director Phil Wallis said in a statement. In 2013 the museum received a $191,000 planning grant for the project from the cultural facilities fund. The grant must be matched with funds from private or other public sources. Down the road in Oak Bluffs, Featherstone will also use its grant for a major campus expansion. The year-round educational art center said the $125,000 in funding will go toward construction of a new art barn and a new pottery studio. Construction of both facilities is already underway. The 6,200-square-foot art barn will include two large classrooms, a teaching kitchen, conference room and office space, and a gallery. The 2,400-square-foot pottery studio is triple the size of the current ceramics studio. Featherstone has raised $4 million for the campus expansion and for an endowment. “We are thrilled to receive this significant award which illustrates the commonwealth’s commitment to the arts and culture during a time when arts funding is at risk,” Featherstone executive director Ann Smith said in a press release. The cultural facilities fund offers competitive grants to community organizations that expand access to the arts and humanities and benefit the economy. For this round, the fund awarded 61 grants totaling about $8.9 million. Nice job Posie!! You are an asset to Featherstone.